This is the story of one Orcutt family in America. Having arrived by 1663, the generations saw most of American history firsthand. Throughout the ages, the Orcutt’s appear to have been hard-working, god-fearing, responsible citizens. A couple themes might be found throughout the generations. From the time that fourth-generation Caleb proudly passed down his joining tools, the Orcutt men seem to have been skilled carpenters. Secondly, in many cases, they seem to have attracted wives from interesting, respected families. For this reason, where possible, information has been included about the maternal lines that have contributed so much to this family tree. Welcome to the geneablogging community! William Orcutt and Mary Lane, as well as John Washburn and Elizabeth Mitchell, were my 9th great-grandparents. 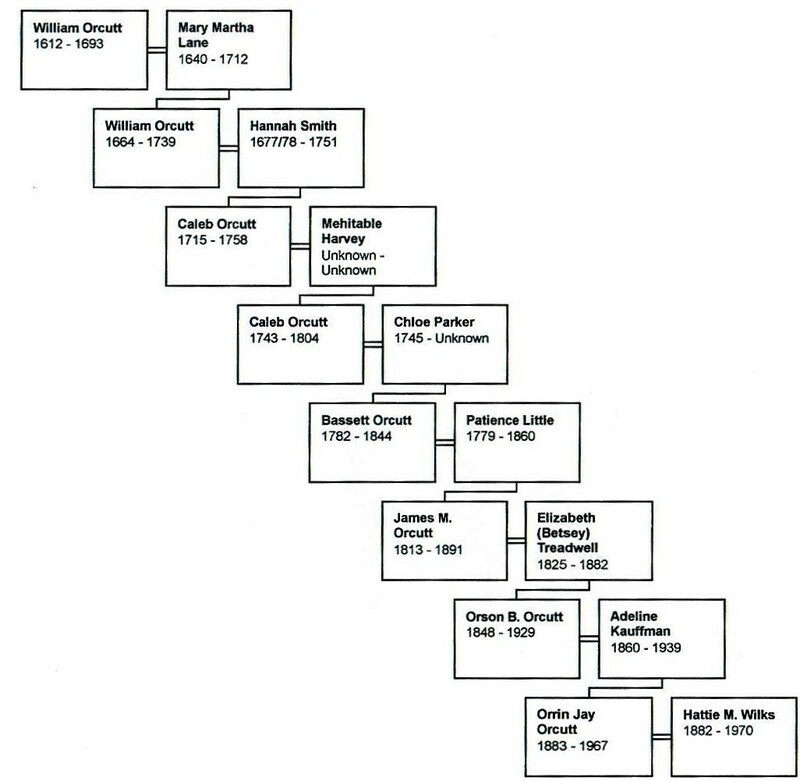 I am descended through John and Mary (Beal) Orcutt and Samuel and Deborah (Packard) Washburn. I’m looking forward to your blog posts for more insight into my collateral lines. Please check out my blog, Pine Trees and Pedigrees, at http://pinetreesandpedigrees.blogspot.com. b: ca 1812 and married Helen Sabina Sprague ? Do you know for sure and with with good source documentation who William’s parents were ? Sorry, Eric, they don’t appear in my family tree at this time. Hello I am a Orcutt son with this also possibly being also my family line . I was wandering did you ever figure out how William got here . I studied all the ships arrivals and passenger lists and can’t find William although he does marry a woman who had parents or grandparents on the Mayflower or ships around that time . Although some of the ships that sailed lists were lost . What are your thoughts ? Craig and Craigston Castle . I also traced the Urquarts to possibly the Staurts , Mary Queen of Scott’s and to early British Royalty that could possibly mean we are related to Prince William and Harry through Diana’s Spencer’s family side ? Sorry, no further news on how William arrived in America. I understand that some Orcutts left Scotland for England long ago. That could have been the migration route of our Orcutt ancestors. I’m planning to visit Scotland soon, although I don’t know that that will reveal the information that we’d like to have. I’ll post anything I discover! This site is a tribute to Myrtle Orcutt, who left her children a handwritten family tree. I am enjoying filling in the details, particularly for her descendants but also for everyone else interested in genealogy whose tree may intersect with this one. When using information from these web pages, please cite your source as follows: Sugden, B. Orcutt Family History. (2014). Retrieved from http://orcuttfamilyhistory. wordpress.com. (Your date of access). © B. Sugden and www.Orcutt Family History.Wordpress.com, 2014. Unauthorized use and/or duplication of this material without express and written permission from this blog’s author and/or owner is strictly prohibited. Excerpts and links may be used, provided that full and clear credit is given to B. Sugden and www.Orcutt Family History.com with appropriate and specific direction to the original content.